Simplicity in form and function! Utilizing what hydraulic and pneumatic engineers call the "perfect flow passage" the AeroInjector achieves outstanding performance versatility! AeroInjector body parts are precision machined from solid 6061 aluminum billets. There are only two moving parts... no float bowls or secondary jets to complicate things! A fine adjustment metering needle provides clean burning, smooth running, outstanding response, and fuel economy! Spigot or flange mounts easily adapt to popular aircraft and auto conversion engines. 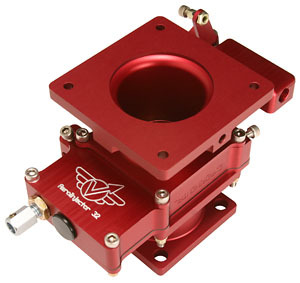 AeroInjector's intake design accepts air filters or carb heat ducts. The AeroInjector is included as standard with all AeroVee engines, and is highly recommended to replace the Bing carb that ships with Jabiru engines. AeroInjectors have been successfully installed in everything from Continentals and Lycomings to Chevy's and Suzuki's! Questions about the difference between the AeroCarb and the new AeroInjector? Check out our FAQ page! For shipping details, view our Shipping Policy. All Orders Subject to Sonex Terms and Conditions.